The MacArthur Foundation just announced the class of 2009 for the "genius grants." And while I sincerely congratulate this year's winners, for the past several years I keep finding a glaring omission from the list of awardees. 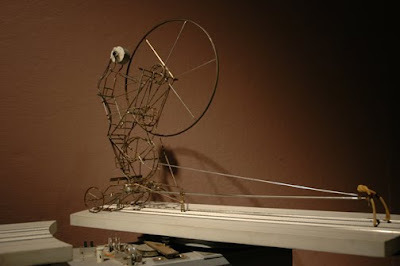 That would be the artist and creator of kinetic sculptures, Arthur Ganson. If anyone has "shown extraordinary originality and dedication in their creative pursuits and a marked capacity for self-direction" to quote the grant standards, it is Arthur Ganson. To further quote from the MacArthur website: "There are three criteria for selection of Fellows: exceptional creativity, promise for important future advances based on a track record of significant accomplishment, and potential for the fellowship to facilitate subsequent creative work." Again an apt description of Arthur and his work. Rather than speak in greater detail for Arthur or his work, I'll just direct you to his excellent website, and the wonderful video from the TED Conference embedded above. Creative work is often un(der)appreciated work, and while many wonderful artists, craftspeople, and facile thinkers will never receive the recognition they deserve, I hope that Arthur Ganson soon becomes part of the cadre of MacArthur award winners. Agree 100%. And he's a really nice, generous guy to boot.